On July 1, the organization will have a new president. Steven Gould has announced that he is running for the position. This makes me happy, and I fully and unreservedly endorse him for president of SFWA. I don’t know who else is on the ballot, but I think I speak for most other Viable Paradise alumni that wouldn’t be against seeing Steve “Without a Hat” Gould* as SFWA President. *Inside joke for VP Alums… For those without the context: Steve Brust, who also teaches at Viable Paradise, was referred to as “Steve with the hat” during the orientation. At least, this was the case during VP 16 when both were present. I mentioned before that I was late to the Limp Bizkit party. I was aware of a few of their earlier singles, but it was Chocolate Starfish that finally got me on the train (and Results May Vary kept me on a little longer). This week’s selection was one of the songs (by nature of the beat) that helped hook me on Starfish. Funny thing that I noticed just now was the cameo that Ben Stiller has in the opening moments of the video. I have, on the table, an offer to study at the University of Glasgow, Scotland. It is an Unconditional offer (on their end), but the biggest hurdle at the moment (on my end), is the finances: international tuition is, shall we say, not as easy on the wallet. But there are scholarships available (besides just straight financial aid), and being applied for. The outcomes of those applications will play a huge part in whether we move, or not. That being said, should the funding work out, Charles Stross – who lives in Edinburgh, mind – recently posted something that I will have to keep in mind regardless of whichever trip ends up happening: jet lag. The second type of jet lag, west-to-east, is the real killer… Traveling west-to-east, each time zone you traversesubtracts an hour from your day. Or night. And in the case of trans-Atlantic journeys, this is usually combined with a red-eye flight — for example, departing and 8pm and arriving 6-7 hours later, but 10-12 hours later according to the clock in your destination time zone. Doing any international traveling soon, but with little prior experience? Check out the full write-up for things to consider. First, a couple of things from John Scalzi… the first, an interview, and the second for the humor of the ensemble. And, as he indicates on his site, for those so interested: if you would like a signed copy of his latest novel (to be released in June) you can preorder here for a limited time. 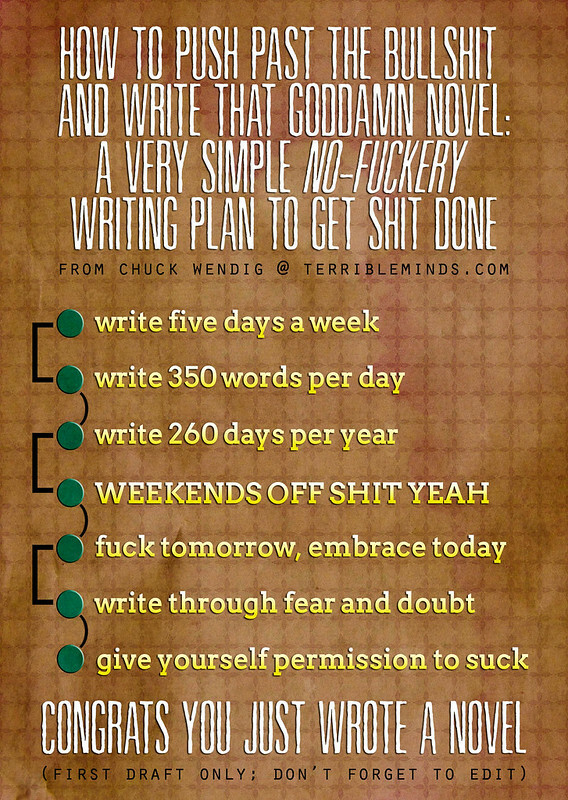 Another piece of writing advice from Chuck Wendig. It’s the brash, matter of fact, non-sugar coating that I can appreciate (and is a contributing factor to some of my own writing lessons over the past year). Wil Wheaton, that is. He’s a geek. He owns it, and anyone that has an inkling of a clue about me knows that somewhere there are all sorts of geek bits in my DNA. But that’s not it. That’s just the tip of the iceberg that led me to seek him out in the early days of the internet, wondering “Whatever happened to…?” That was driven by my interest in both Stand by Me and, of course ST:TNG. I didn’t visit his site regularly in those days. No, that didn’t actually start happening until maybe six years ago. And here’s why I keep going back, and why I think many of my fellow Seton Hill people or Viable Paradise crew should to (if their not already) – or anyone else, for that matter, that may be into writing. In many ways, many of us are in the same boat in terms of writerly XP – working on that first novel. Sure, he’s got more publishing credits in a variety of forms – but none of them are novel length. Which strikes to the core of something that has been a major thing for me the last few months, a little soul searching and self-appraisal as far as my own writing goes. I read Wheaton’s blog because in addition to his geek/acting stuff, he is a writer, just as insecure as the rest of us, and still near the start of his own (prose) writing career. And I wish him well. This week brings us another of those “radio/video” combinations that it took a while for me to remember. Mumford & Sons seems to be an ensemble right up my alley for a live show. They have more of a folk sound, and from what little I’ve read most of the members are multi-instrumentalists.